Rick Snyder says Flint water crisis was not about money. 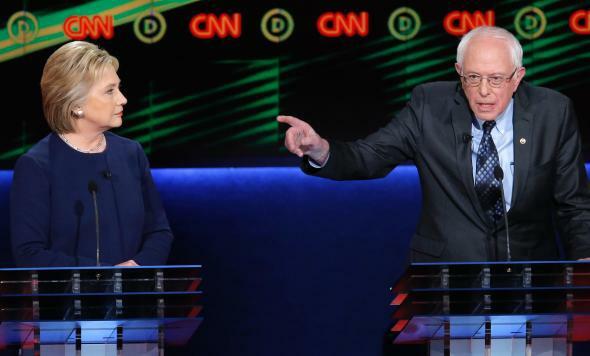 Hillary Clinton and Bernie Sanders at the Democratic debate in Flint, Michigan on Sunday. This was never about money. This was a failure of government at all levels that could be described as a massive error of bureaucracy. 1. The massive bureaucratic failure was mostly his responsibility. The “emergency managers” in Flint who authorized and implemented the city’s switch to Flint River water were appointed by Snyder. The Michigan Department of Environmental Quality, which ignored and obscured evidence of the developing lead problem to an almost unbelievable degree, was run by Snyder’s appointee. It was only nine months ago that Flint officials turned off the flow of already-treated Lake Huron water from the city of Detroit and started treating their own raw water from the Flint River instead, calculating that the switch could save roughly $5 million in less than two years. If Snyder had said the crisis was about more than money, he would’ve been right. He’s also by no means the only person to blame here—the (mostly Democratic) public servants in Flint and the federal regulators in the EPA also failed. Moreover, Flint was in a financial crisis; the need to cut spending was real, not some cruel conservative contrivance. But to insist this issue is only about bureaucracy and not about money is a disappointingly glib and partisan thing for the governor to say. What it calls to mind is something I believe that conservative satirist P.J. O’Rourke once said, which, to paraphrase, is that a Democrat is a politician who claims government can work, gets elected, and proves himself wrong, and a Republican is a politician who claims government can’t work, gets elected, and proves himself right. Read more in Slate about Flint, Michigan’s drinking water emergency and the Democratic primary.